1999-10-27 Assigned to PHILLIPS PETROLEUM COMPANY, A CORPORATION OF DELAWARE reassignment PHILLIPS PETROLEUM COMPANY, A CORPORATION OF DELAWARE ASSIGNMENT OF ASSIGNORS INTEREST (SEE DOCUMENT FOR DETAILS). 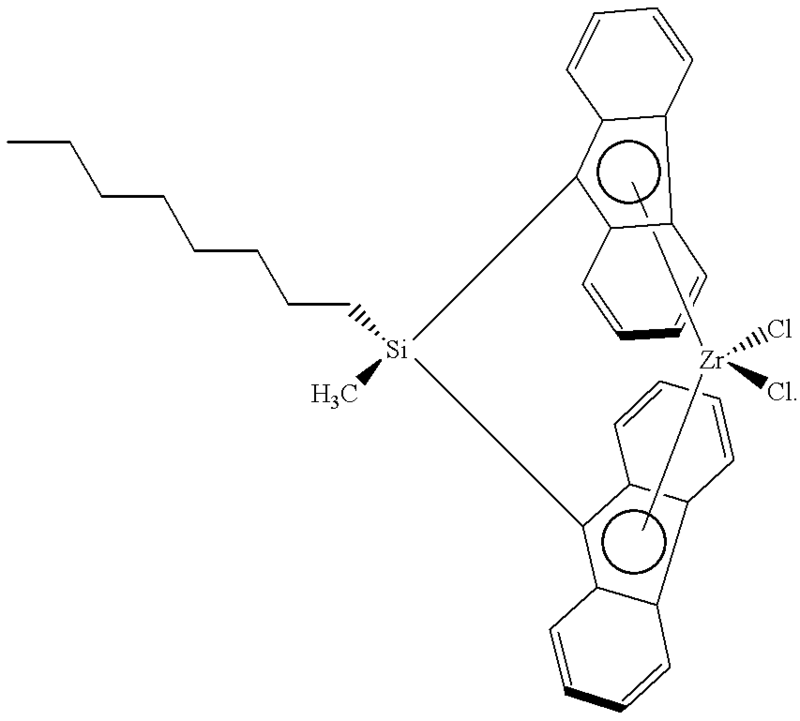 Assignors: BENHAM, ELIZABETH A., COLLINS, KATHY S., EATON, ANTHONY P., HAWLEY, GIL R., JENSEN, MICHAEL D., MARTIN, JOEL L., MCDANIEL, MAX P.
This invention provides a catalyst composition for polymerizing at least one monomer to produce a polymer, wherein said catalyst composition comprises an organometal compound, an organoaluminum compound, and a treated solid oxide compound comprising nickel, a halogen, and a solid oxide compound. This invention is related to the field of organometal catalyst compositions. The production of polymers is a multi-billion dollar business. This business produces billions of pounds of polymers each year. Millions of dollars have been spent on developing technologies that can add value to this business. One of these technologies is called metallocene catalyst technology. Metallocene catalysts have been known since about 1960. However, their low productivity did not allow them to be commercialized. About 1975, it was discovered that contacting one part water with one part trimethylaluminum to form methyl aluminoxane, and then contacting such methyl aluminoxane with a metallocene compound, formed a metallocene catalyst that had greater activity. However, it was soon realized that large amounts of expensive methyl aluminoxane were needed to form an active metallocene catalyst. This has been a significant impediment to the commercialization of metallocene catalysts. Borate compounds have been used in place of large amounts of methyl aluminoxane. However, this is not satisfactory, since borate compounds are very sensitive to poisons and decomposition, and can also be very expensive. It should also be noted that having a heterogeneous catalyst is important. This is because heterogeneous catalysts are required for most modern commercial polymerization processes. Furthermore, heterogeneous catalysts can lead to the formation of substantially uniform polymer particles that have a high bulk density. These types of substantially uniformed particles are desirable because they improve the efficiency of polymer production and transportation. Efforts have been made to produce heterogeneous metallocene catalysts; however, these catalysts have not been entirely satisfactory. Therefore, the inventors provide this invention to help solve these problems. An object of this invention is to provide a process that produces a catalyst composition that can be used to polymerize at least one monomer to produce a polymer. Another object of this invention is to provide the catalyst composition. Another object of this invention is to provide a process comprising contacting at least one monomer and the composition under polymerization conditions to produce the polymer. Another object of this invention is to provide an article that comprises the polymer produced with the catalyst composition of this invention. wherein the solid oxide compound is selected from the group consisting of alumina, aluminophosphate, aluminosilicate, and mixtures thereof. In accordance with another embodiment of this invention, a process is provided comprising contacting at least one monomer and the catalyst composition under polymerization condition to produce a polymer. In accordance with another embodiment of this invention, an article is provided. The article comprises the polymer produced in accordance with this invention. These objects, and other objects, will become more apparent to those with ordinary skill in the art after reading this disclosure. In this formula, M1 is selected from the group consisting of titanium, zirconium, and hafnium. Currently, it is most preferred when M1 is zirconium. In this formula, (X1) is independently selected from the group consisting of (hereafter “Group OMC-I”) cyclopentadienyls, indenyls, fluorenyls, substituted cyclopentadienyls, substituted indenyls, such as, for example, tetrahydroindenyls, and substituted fluorenyls, such as, for example, octahydrofluorenyls. Substituents on the substituted cyclopentadienyls, substituted indenyls, and substituted fluorenyls of (X1) can be selected independently from the group consisting of aliphatic groups, cyclic groups, combinations of aliphatic and cyclic groups, silyl groups, alkyl halide groups, halides, organometallic groups, phosphorus groups, nitrogen groups, silicon, phosphorus, boron, germanium, and hydrogen, as long as these groups do not substantially, and adversely, affect the polymerization activity of the composition. Suitable examples of aliphatic groups are hydrocarbyls, such as, for example, paraffins and olefins. Suitable examples of cyclic groups are cycloparaffms, cycloolefins, cycloacetylenes, and arenes. 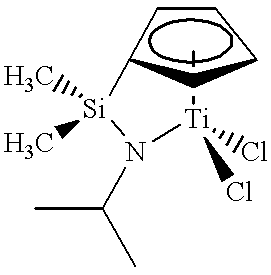 Substituted silyl groups include, but are not limited to, alkylsilyl groups where each alkyl group contains from 1 to about 12 carbon a toms, arylsilyl groups, and arylalkylsilyl groups. Suitable alkyl halide groups have alkyl groups with 1 to about 12 carbon atoms. 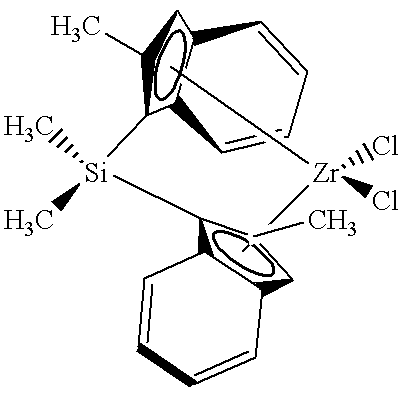 Suitable organometallic groups include, but are not limited to, substituted silyl derivatives, substituted tin groups, substituted germanium groups, and substituted boron groups. Suitable examples of such substituents are methyl, ethyl, propyl, butyl, tert-butyl, isobutyl, amyl, isoamyl, hexyl, cyclohexyl, heptyl, octyl, nonyl, decyl, dodecyl, 2-ethylhexyl, pentenyl, butenyl, phenyl, chloro, bromo, iodo, trimethylsilyl, and phenyloctylsilyl. In this formula, (X3) and (X4) are independently selected from the group consisting of (hereafter “Group OMC-II”) halides, aliphatic groups, substituted aliphatic groups, cyclic groups, substituted cyclic groups, combinations of aliphatic groups and cyclic groups, combinations of substituted aliphatic groups and cyclic groups, combinations of aliphatic groups and substituted cyclic groups, combinations of substituted aliphatic and substituted cyclic groups, amido groups, substituted amido groups, phosphido groups, substituted phosphido groups, alkyloxide groups, substituted alkyloxide groups, aryloxide groups, substituted aryloxide groups, organometallic groups, and substituted organometallic groups, as long as these groups do not substantially, and adversely, affect the polymerization activity of the composition. Suitable examples of aliphatic groups are hydrocarbyls, such as, for example, paraffins and olefins. Suitable examples of cyclic groups are cycloparaffms, cycloolefins, cycloacetylenes, and arenes. Currently, it is preferred when (X3) and (X4) are selected from the group consisting of halides and hydrocarbyls, where such hydrocarbyls have from 1 to about 10 carbon atoms. However, it is most preferred when (X3) and (X4) are selected from the group consisting of fluoro, chloro, and methyl. In this formula, (X2) can be selected from either Group OMC-I or Group OMC-II. At least one substituent on (X1) or (X2) can be a bridging group that connects (X1) and (X2), as long as the bridging group does not substantially, and adversely, affect the activity of the composition. Suitable bridging groups include, but are not limited to, aliphatic groups, cyclic groups, combinations of aliphatic groups and cyclic groups, phosphorous groups, nitrogen groups, organometallic groups, silicon, phosphorus, boron, and germanium. Suitable examples of aliphatic groups are hydrocarbyls, such as, for example, paraffins and olefins. Suitable examples of cyclic groups are cycloparaffins, cycloolefins, cycloacetylenes, and arenes. Suitable organometallic groups include, but are not limited to, substituted silyl derivatives, substituted tin groups, substituted germaniwn groups, and substituted boron groups. Various processes are known to make these organometal compounds. See, for example, U.S. Pat. Nos. 4,939,217; 5,210,352; 5,436,305; 5,401,817; 5,631,335, 5,571,880; 5,191,132; 5,480,848; 5,399,636; 5,565,592; 5,347,026; 5,594,078; 5,498,581; 5,496,781; 5,563,284; 5,554,795; 5,420,320; 5,451,649; 5,541,272; 5,705,478; 5,631,203; 5,654,454; 5,705,579; and 5,668,230; the entire disclosures of which are hereby incorporated by reference. In this formula, (X5) is a hydrocarbyl having from 1 to about 20 carbon atoms. Currently, it is preferred when (X5) is an alkyl having from 1 to about 10 carbon atoms. However, it is most preferred when (X5) is selected from the group consisting of methyl, ethyl, propyl, butyl, and isobutyl. In this formula, (X6) is a halide, hydride, or alkoxide. Currently, it is preferred when (X6) is independently selected from the group consisting of fluoro and chloro. However, it is most preferred when (X6) is chloro. In this formula, “n” is a number from 1 to 3 inclusive. However, it is preferred when “n” is 3. The treated solid oxide compound comprises nickel, a halogen, and a solid oxide compound. 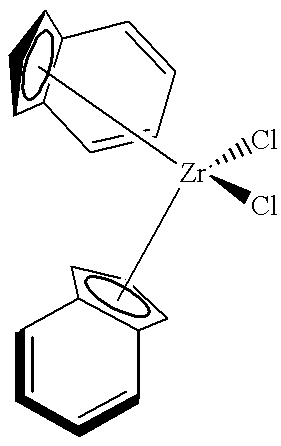 The halogen is selected from the group consisting of chlorine and bromine. The solid oxide compound is selected from the group consisting of alumina, aluminophosphate, aluminosilicate, and mixtures thereof. Preferably, the solid oxide compound is alumina. The solid oxide compound should have a pore volume greater than about 0.5 cc/g, preferably greater than about 0.8 cc/g, and most preferably, greater than 1.0 cc/g. The solid oxide compound should have a surface area in a range of about 100 to about 1000 m2/g, preferably from about 200 to about 800 m2/g, and most preferably, from 250 to 600 m2/g. To produce the treated solid oxide compound, the solid oxide compound is treated with a nickel-containing compound, in order to add nickel to the solid oxide compound. Nickel can be added to the solid oxide compound by any method known in the art. In a first method, nickel can be added to the solid oxide compound by cogellation of aqueous materials, as disclosed in U.S. Pat. Nos. 3,887,494; 3,119,569; 4,405,501; 4,436,882; 4,436,883; 4,392,990; 4,081,407; 4,981,831; and 4,152,503; the entire disclosures of which are hereby incorporated by reference. In a second method, the nickel can be added to the solid oxide compound by cogellation in an organic or anhydrous solution as disclosed in U.S. Pat. Nos. 4,301,034; 4,547,557; and 4,339,559; the entire disclosures of which are hereby incorporated by reference. The preferred method is to impregnate the solid oxide compound with an aqueous or organic solution of a nickel-containing compound prior to calcining to produce a nickel-containing solid oxide compound. A suitable amount of the solution is utilized to provide the desired concentration of nickel after drying. The nickel-containing solid oxide compound is then dried by any suitable method known in the art. For example, the drying can be accomplished by vacuum drying, spray drying, or flash drying. Any nickel-containing compound known in the art that can impregnate the solid oxide compound with nickel can be used in this invention. The nickel-containing compound can be any water soluble nickel salt, such as, for example, nickel nitrate, nickel chloride, nickel sulfate, nickel acetate, or nickel citrate. The nickel-containing compound can also be an organic nickel compound, such as, for example, nickel acetylacetonate, nickel ethylhexanoate, nickel naphthenate, and mixtures thereof. Generally, the amount of nickel present is in the range of about 0.1 to about 10 millimoles per gram of nickel-containing solid oxide compound before calcining. Preferably, the amount of nickel present is in the range of about 0.5 to about 5 millimoles per gram of nickel-containing solid oxide compound before calcining. Most preferably, the amount of nickel present is in the range of 1 to 3 millimoles per gram of nickel-containing solid oxide compound before calcining. After the solid oxide compound is combined with the nickel-containing compound to produce a nickel-containing solid oxide compound, it is then calcined for about 1 minute to about 100 hours, preferably for about 1 hour to about 50 hours, and most preferably, from 3 hours to 20 hours. The calcining is conducted at a temperature in a range of about 200 to about 900° C., preferably, in a range of about 300 to about 800° C., and most preferably, in a range of 400 to 700° C. Any type of suitable ambient can be used during calcining. Generally, calcining can be completed in an inert atmosphere. Alternatively, an oxidizing atmosphere, such as, for example, oxygen or air, or a reducing atmosphere, such as, for example, hydrogen or carbon monoxide, can be used. 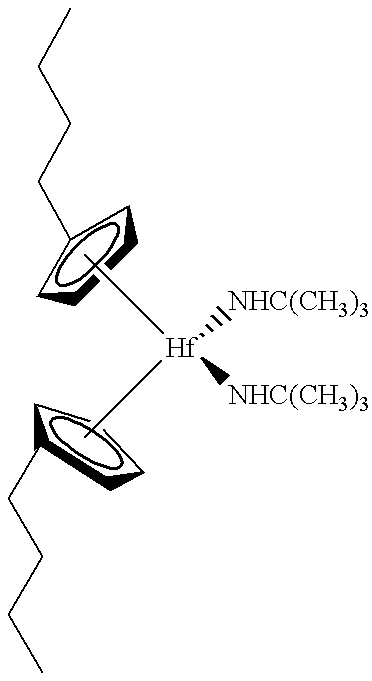 After or during calcining, the nickel-containing solid oxide compound is contacted with a halogen-containing compound to produce the treated solid oxide compound. The halogen-containing compound is at least one compound selected from the group consisting of chloride-containing compounds and bromide-containing compounds. 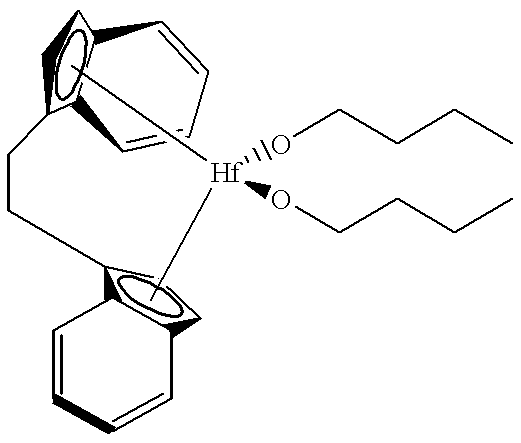 The halogen-containing compound can be in a liquid or preferably, a vapor phase. The nickel-containing solid oxide compound can be contacted with the halogen-containing compound by any means known in the art. Preferably, the halogen-containing compound can be vaporized into a gas stream used to fluidize the solid oxide compound during calcining. The nickel-containing solid oxide compound is contacted with the halogen-containing compound generally from about I minute to about 10 hours, preferably, from about 5 minutes to about 2 hours, and most preferably, from 10 minutes to 30 minutes. Generally, the nickel-containing solid oxide compound is in contact with the halogen-containing compound at a temperature in the range of about 200 to about 900° C., preferably, at a temperature in a range of about 300 to about 800° C., and most preferably, in a range of 400 to 700° C. Any type of suitable ambient can be used to contact the nickel-containing solid oxide compound and the halogen-containing compound. Preferably, an inert atmosphere is used. Alternatively, an oxidizing or reducing atmosphere can also be used. Suitable halogen-containing compounds include volatile or liquid organic chloride or bromide compounds and inorganic chloride or bromide compounds. Organic chloride or bromide compounds can be selected from the group consisting of carbon tetrachloride, chloroform, dichloroethane, hexachlorobenzene, trichloroacetic acid, bromoform, dibromomethane, perbromopropane, and mixtures thereof. Inorganic chloride or bromide compounds can be selected from the group consisting of gaseous hydrogen chloride, silicon tetrachloride, tin tetrachloride, titanium tetrachloride, aluminum trichloride, boron trichloride, thionyl chloride, sulfuryl chloride, hydrogen bromide, boron tribromide, silicon tetrabromide, and mixtures thereof. Additionally, chlorine and bromine can be used. Optionally, a fluorine-containing compound can also be included when contacting the nickel-containing solid oxide compound with the halogen-containing compound to achieve higher activity in some cases. The amount of halogen present in the treated solid oxide compound is generally in the range of about 2 to about 150% by weight, preferably about 10% to about 100% by weight, and most preferably, 15% to 75% by weight, where the weight percents are based on the weight of the treated solid oxide compound before calcining. The compositions of this invention can be produced by contacting the organometal compound, the treated solid oxide compound, and the organoaluminum compound, together. This contacting can occur in a variety of ways, such as, for example, blending. Furthermore, each of these compounds can be fed into the reactor separately, or various combinations of these compounds can be contacted together before being further contacted in the reactor, or all three compounds can be contacted together before being introduced into the reactor. Currently, one method is to first contact an organometal compound and the treated solid oxide compound together, for about 1 minute to about 24 hours, preferably, about 1 minute to about 1 hour, at a temperature from about 10° C. to about 100° C., preferably 15° C. to 50° C., to form a first mixture, and then contact this first mixture with an organoaluminum compound to form the catalyst composition. Another method is to precontact the organometal compound, the organoaluminum compound, and the treated solid oxide compound before injection into a polymerization reactor for about 1 minute to about 24 hours, preferably, 1 minute to 1 hour, at a temperature from about 10° C. to about 200° C., preferably 20° C. to 80° C. to produce the catalyst composition. A weight ratio of the organoaluminum compound to the treated solid oxide compound in the composition ranges from about 5:1 to about 1:1000, preferably, from about 3:1 to about 1:100, and most preferably, from 1:1 to 1:50. A weight ratio of the treated solid oxide compound to the organometal compound in the composition ranges from about 10,000:1 to about 1:1, preferably, from about 1000:1 to about 10:1, and most preferably, from 250:1 to 20:1. These ratios are based on the amount of the components combined to give the catalyst composition. After contacting, the composition comprises a post-contacted organometal compound, a post-contacted organoaluminum compound, and a post-contacted treated solid oxide compound. It should be noted that the post-contacted solid oxide compound is the majority, by weight, of the composition. Often times, specific components of a catalyst are not known, therefore, for this invention, the composition is described as comprising post-contacted compounds. A weight ratio of the post-contacted organoaluminum compound to the post-contacted treated solid oxide compound in the composition ranges from about 5:1 to about 1:1000, preferably, from about 3:1 to about 1:100, and most preferably, from 1:1 to 1:50. A weight ratio of the post-contacted treated solid oxide compound to the post-contacted organometal compound in the composition ranges from about 10,000:1 to about 1:1, preferably, from about 1000:1 to about 10:1, and most preferably, from 250:1 to 20:1. The composition of this invention has an activity greater than a composition that uses the same organometal compound, and the same organoaluminum compound, but uses silica, alumina, or a chlorided alumina that has not been impregnated with nickel as an activator for the organometal compound as shown in comparative examples 1-3. The activity is measured under slurry polymerization conditions, using isobutane as the diluent, and with a polymerization temperature of about 50 to about 110° C., and an ethylene pressure of about 400 to about 800 psig. When comparing activities, the polymerization runs should occur at the same polymerization conditions. The reactor should have substantially no indication of any wall scale, coating or other forms of fouling. However, it is preferred if the activity is greater than about 1000 grams of polymer per gram of treated solid oxide compound per hour, more preferably greater than about 2000, and most preferably greater than 3000. This activity is measured under slurry polymerization conditions, using isobutane as the diluent, and with a polymerization temperature of 90° C., and an ethylene pressure of 550 psig. The reactor should have substantially no indication of any wall scale, coating or other forms of fouling. One of the important aspects of this invention is that no aluminoxane needs to be used in order to form the composition. Aluminoxane is an expensive compound that greatly increases polymer production costs. This also means that no water is needed to help form such aluminoxanes. This is beneficial because water can sometimes kill a polymerization process. It should be noted that no fluorophenyl borate or other fluoro organic boron compounds need to be used in order to form the catalyst composition. In summary, this means that the catalyst composition, which is heterogenous, and which can be used for polymerizing monomers, can be easily and inexpensively produced because of the substantial absence of any aluminoxane compounds or borate compounds. Additionally, no organochromium compounds or MgCl2 need to be added to form the invention. Although aluminoxane, fluoro organic boron compounds, organochromium compounds, or MgCl2 are not needed in the preferred embodiments, these compounds can be used in other embodiments of this invention. In another embodiment of this invention, a process comprising contacting at least one monomer and the catalyst composition to produce at least one polymer is provided. The term “polymer” as used in this disclosure includes homopolymers and copolymers. The catalyst composition can be used to polymerize at least one monomer to produce a homopolymer or a copolymer. Usually, homopolymers are comprised of monomer residues, having 2 to about 20 carbon atoms per molecule, preferably 2 to about 10 carbon atoms per molecule. Currently, it is preferred when at least one monomer is selected from the group consisting of ethylene, propylene, 1-butene, 3-methyl-1-butene, 1-pentene, 3-methyl-1-pentene, 4-methyl-1-pentene, 1-hexene, 3-ethyl-1-hexene, 1-heptene, 1-octene, 1-nonene, 1-decene, and mixtures thereof. When a homopolymer is desired, it is most preferred to polymerize ethylene or propylene. When a copolymer is desired, the copolymer comprises monomer residues and one or more comonomer residues, each having from about 2 to about 20 carbon atoms per molecule. Suitable comonomers include, but are not limited to, aliphatic 1-olefms having from 3 to 20 carbon atoms per molecule, such as, for example, propylene, 1-butene, 1-pentene, 4-methyl-1-pentene, 1-hexene, 1-octene, and other olefins and conjugated or nonconjugated diolefins such as 1,3-butadiene, isoprene, piperylene, 2,3-dimethyl-1,3-butadiene, 1,4-pentadiene, 1,7-hexadiene, and other such diolefins and mixtures thereof. When a copolymer is desired, it is preferred to polymerize ethylene and at least one comonomer selected from the group consisting of 1-butene, 1-pentene, 1-hexene, 1-octene, and 1-decene. The amount of comonomer introduced into a reactor zone to produce a copolymer is generally from about 0.01 to about 10 weight percent comonomer based on the total weight of the monomer and comonomer, preferably, about 0.01 to about 5, and most preferably, 0.1 to 4. Alternatively, an amount sufficient to give the above described concentrations, by weight, in the copolymer produced can be used. Processes that can polymerize at least one monomer to produce a polymer are known in the art, such as, for example, slurry polymerization, gas phase polymerization, and solution polymerization. It is preferred to perform a slurry polymerization in a loop reaction zone. Suitable diluents used in slurry polymerization are well known in the art and include hydrocarbons which are liquid under reaction conditions. The term “diluent” as used in this disclosure does not necessarily mean an inert material; it is possible that a diluent can contribute to polymerization. Suitable hydrocarbons include, but are not limited to, cyclohexane, isobutane, n-butane, propane, n-pentane, isopentane, neopentane, and n-hexane. Furthermore, it is most preferred to use isobutane as the diluent in a slurry polymerization. Examples of such technology can be found in U.S. Pat. Nos. 4,424,341; 4,501,885; 4,613,484; 4,737,280; and 5,597,892; the entire disclosures of which are hereby incorporated by reference. The catalyst compositions used in this process produce good quality polymer particles without substantially fouling the reactor. When the catalyst composition is to be used in a loop reactor zone under slurry polymerization conditions, it is preferred when the particle size of the treated solid oxide compound is in the range of about 10 to about 1000 microns, preferably about 25 to about 500 microns, and most preferably, 50 to 200 microns, for best control during polymerization. 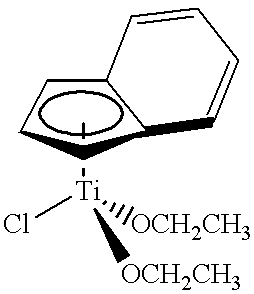 (5) after between 1 minute and 1 hour, combining the mixture and triethylaluminum to produce the catalyst composition. Hydrogen can be used with this invention in a polymerization process to control polymer molecular weight. After the polymers are produced, they can be formed into various articles, such as, for example, household containers and utensils, film products, drums, fuel tanks, pipes, geomembranes, and liners. Various processes can form these articles. Usually, additives and modifiers are added to the polymer in order to provide desired effects. It is believed that by using the invention described herein, articles can be produced at a lower cost, while maintaining most, if not all, of the unique properties of polymers produced with metallocene catalysts. A “Quantachrome Autosorb-6 Nitrogen Pore Size Distribution Instrument” was used to determined surface area and pore volume. This instrument was acquired from the Quantachrome Corporation, Syosset, N.Y.
Silica was obtained from W. R. Grace, grade 952, having a pore volume of about 1.6 cc/g and a surface area of about 300 m2/g. Alumina was obtained from Akzo Nobel Chemical as Ketjen grade B alumina having a pore volume of about 1.78 cc/g and a surface area of around 350 m2/g. To calcine each of the oxide compounds, about 10 grams were placed in a 1.75 inch quartz tube fitted with a sintered quartz disk at the bottom. While the oxide compound was supported on the disk, dry air was blown up through the disk at the linear rate of about 1.6 to about 1.8 standard cubic feet per hour. An electric furnace around the quartz tube was then turned on, and the temperature was raised at the rate of 400 degrees centigrade per hour to the indicated temperature, such as 600° C. At that temperature, the oxide compound was allowed to fluidize for three hours in the dry air. Afterward, the oxide compound was collected and stored under dry nitrogen, where it was protected from the atmosphere until ready for testing. It was never allowed to experience any exposure to the atmosphere. Polymerization runs were made in a 2.2 liter steel reactor equipped with a marine stirrer running at 400 revolutions per minute (rpm). The reactor was surrounded by a steel jacket containing boiling methanol with a connection to a steel condenser. The boiling point of the methanol was controlled by varying nitrogen pressure applied to the condenser and jacket, which permitted precise temperature control to within half a degree centigrade, with the help of electronic control instruments. Unless otherwise stated, first, a small amount (0.01 to 0.10 grams normally) of the oxide compound or the treated solid oxide compound was charged under nitrogen to a dry reactor. Next, 2.0 milliliters of a toluene solution containing 0.5 percent by weight of bis(n-butylcyclopentadienyl) zirconium dichloride were added, followed by 0.6 liters of isobutane liquid. Then, 2.0 milliliters of a 1.0 molar solution of triethylaluminum (TEA) were added, followed by another 0.6 liters of isobutane liquid. Then, the reactor was heated up to the specified temperature. Finally, ethylene was added to the reactor to equal a fixed pressure of about 550 psig to produce a reaction mixture. The reaction mixture was allowed to stir for usually about one hour. As ethylene was consumed, more ethylene flowed in to maintain the pressure. The activity was noted by recording the flow of ethylene into the reactor to maintain the set pressure. After the allotted time, the ethylene flow was stopped, and the reactor slowly depressurized and opened to recover a granular polymer. In all cases, the reactor was clean with no indication of any wall scale, coating or other forms of fouling. The polymer was then removed and weighed. Activity was specified as grams of polymer produced per gram of oxide compound or treated solid oxide compound charged per hour. Specific examples of this invention are described below. The results of these polymerization runs are listed in Table 1. A 0.5686 gram sample of silica calcined per the procedure discussed previously was charged to the reactor for polymerization tests. Two milliliters of 1.0 molar triethylaluminum were added to the reactor along with 2 milliliters of 0.5 weight percent bis(n-butylcyclopentadienyl) zirconium dichloride. During a polymerization run of 63.0 minutes, 0.65 grams of polymer were produced yielding an activity of 1 gram of polymer per gram of silica per hour. A 0.2361 gram sample of alumina calcined per the procedure discussed previously was charged to the reactor for polymerization tests. 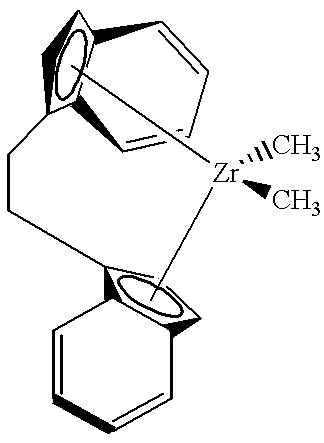 Two milliliters of 1.0 molar triethylaluminum were added along with 2 milliliters of 0.5 weight percent bis(n-butylcyclopentadienyl) zirconium dichloride. During a polymerization run of 60.9 minutes, 6.9 grams of polymer were produced yielding an activity of 29 grams of polymer per gram of alumina per hour. Ten grams of Ketjen grade B alumina were calcined in air for three hours at 600° C. as described previously. After calcining, the furnace temperature was maintained at 600° C., and the gas stream was changed from air to dry nitrogen. Then, 2.3 milliliters of carbon tetrachloride were injected into the nitrogen stream and evaporated upstream from the alumina bed. The carbon tetrachloride vapor was carried up through the bed and reacted with the alumina to produce a chlorided alumina. The chlorided alumina was white in color. A sample of the chlorided alumina, weighing 0.2058 grams, was then charged to the reactor for polymerization tests. 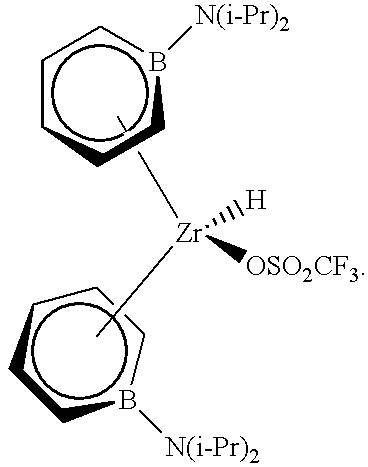 Two milliliters of 1.0 molar triethylaluminum were added along with 2 milliliters of 0.5 percent bis(n-butylcyclopentadienyl)zirconium dichloride. During a polymerization run of 63.0 minutes, 351.5 grams of polymer were produced yielding an activity of 1627 grams of polymer per gram of chlorided alumina per hour. 27.3 grams of the Ketjen Grade B alumina were impregnated with 50 milliliters of an aqueous solution containing 7.94 grams of nickel nitrate hexahydrate (or 1 mmol of nickel per gram of alumina) to yield a wet sand consistency. This produced a nickel-containing alumina. The nickel-containing alumina was dried under vacuum at 120° C. for 16 hours. The nickel-containing alumina was pushed through a 100 mesh screen to produce a light green powder. Fifty milliliters of the nickel-containing alumina, or about 14 grams, were calcined in dry air for three hours at 600° C. Then, the air stream was changed to dry nitrogen, and 2.5 milliliters of carbon tetrachloride were injected into the nitrogen stream under the bed of nickel-containing alumina. The carbon tetrachloride evaporated over about 10 minutes, and the vapors were carried up through the nickel-containing alumina bed contacting and reacting with the nickel-containing alumina to produce a chlorided, nickel-containing alumina. Then, the chlorided, nickel-containing alumina was cool and stored under nitrogen for later polymerization tests. The chlorided, nickel-containing alumina had a light blue-green color. A sample of the chlorided, nickel-containing alumina, weighing 0.1101 grams, was then charged to the reactor for polymerization tests. 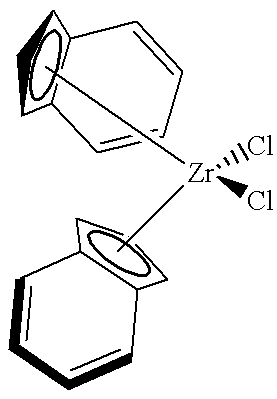 Two milliliters of 1.0 molar triethylaluminum were added along with 2 milliliters of 0.5 percent bis(n-butylcyclopentadienyl)zirconium dichloride. During 41.5 minutes of a polymerization run, 281 grams of polymer were produced yielding an activity of 3690 grams of polymer per gram of chlorided, nickel-containing alumina per hour. Polymerization at 90° C., 550 psig, and 1.2 liters of isobutane for about an hour; Organometal Compound = 25 micromoles bis(n-butyl cyclopentadienyl) zirconium dichloride, or 2.3 mg Zr; Organoaluminum Compound = 2 mls of 15% by wt triethylaluminum in heptane. *Test Compound = oxide compound or treated solid oxide compound. *Activity = grams of polymer per gram of test compound per hour. While this invention has been described in detail for the purpose of illustration, it is not intended to be limited thereby but is intended to cover all changes and modifications within the spirit and scope thereof. wherein said solid oxide compound is selected from the group consisting of alumina, aluminophosphate, aluminosilicate, and mixtures thereof. 5) after between 1 minute and 1 hour, combining said mixture and triethylaluminum to produce said catalyst composition. 3. A process according to claim 2 wherein said process consists essentially of steps (1), (2), (3), (4), and (5). 4. A process according to claim 1 wherein said treated solid oxide compound is calcined at a temperature in a range of about 300° C. to about 800° C. and a time in a range of about 1 hour to about 50 hours. 5. A process according to claim 4 wherein said treated solid oxide compound is calcined at a temperature in a range of 400° C. to 700° C. and a time in a range of 3 hours to 20 hours. 6. A process according to claim 1 wherein said organometal compound, said treated solid oxide compound, and said organoaluminum are combined by 1) contacting said organometal compound and said treated solid oxide compound for about 1 minute to about 24 hours at a temperature from about 10° C. to about 100° C. to form a first mixture; and 2) contacting said first mixture with said organoaluminum compound to form said catalyst composition. 7. A process according to claim 6 wherein said organometal compound, said treated solid oxide compound, and said organoaluminum are combined by 1) contacting said organometal compound and said treated solid oxide compound for 1 minute to 1 hour at a temperature from 15° C. to 50° C. to form a first mixture; and 2) contacting said first mixture with said organoaluminum compound to form said catalyst composition. 8. A process according to claim 1 wherein said organometal compound, said organoaluminum compound, and said treated solid oxide compound are precontacted for 1 minute to 1 hour at a temperature in a range of 20° C. to 80° C.
9. A process according to claim 1 consisting essentially of contacting said organometal compound, said treated solid oxide compound, and said organoaluminum compound to produce said catalyst composition. 10. A process according to claim 9 wherein said treated solid oxide compound is calcined at a temperature in a range of about 300° C. to about 800° C. and a time in a range of about 1 hour to about 50 hours. 11. A process according to claim 10 wherein said treated solid oxide compound is calcined at a temperature in a range of 400° C. to 700° C. and a time in a range of 3 hours to 20 hours. 12. A process according to claim 9 wherein said organometal compound, said treated solid oxide compound, and said organoaluminum are combined by 1) contacting said organometal compound and said treated solid oxide compound for about 1 minute to about 24 hours at a temperature from about 10° C. to about 100° C. to form a first mixture; and 2) contacting said first mixture with said organoaluminum compound to form said catalyst composition. 13. A process according to claim 9 wherein said organometal compound, said organoaluminum compound, and said treated solid oxide compound are precontacted for 1 minute to 1 hour at a temperature in a range of 20° C. to 80° C.
14. 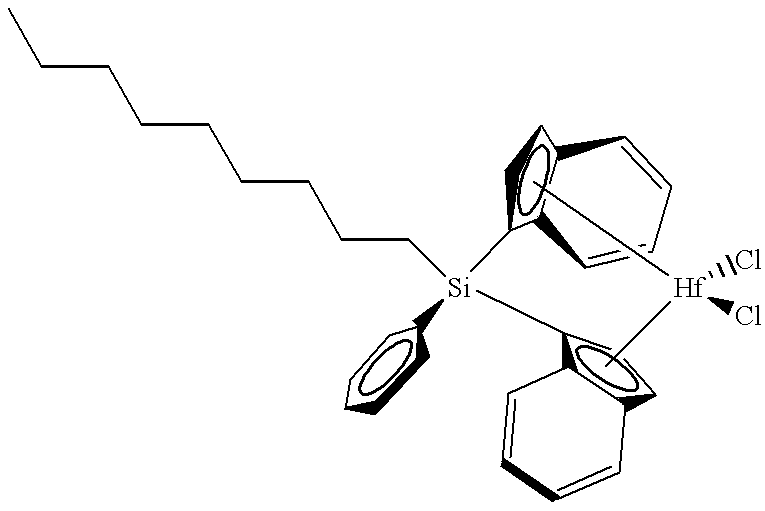 A catalyst composition produced by said process of claim 1. 15. A catalyst composition according to claim 14 wherein said catalyst composition has an activity greater than 2000 under slurry polymerization conditions, using isobutane as a diluent, with a polymerization temperature of 90° C., and an ethylene pressure of 550 psig. 16. A catalyst composition according to claim 15 wherein said catalyst composition has an activity greater than 3000 under slurry polymerization conditions, using isobutane as a diluent, with a polymerization temperature of 90° C., and an ethylene pressure of 550 psig. 17. A catalyst composition according to claim 15 wherein a weight ratio of said organoaluminum compound to said treated solid oxide compound in said catalyst composition ranges from about 3:1 to about 1:100. 18. A catalyst composition according to claim 17 wherein said weight ratio of said organoaluminum compound to said treated solid oxide compound in said catalyst composition ranges from 1:1 to 1:50. 19. A catalyst composition according to claim 15 wherein a weight ratio of said treated solid oxide compound to said organometal compound in said catalyst composition ranges from about 1000:1 to about 10:1. 20. A catalyst composition according to claim 19 wherein said weight ratio of said treated solid oxide compound to said organometal compound in said catalyst composition ranges from 250:1 to 20:1. 21. A catalyst composition according to claim 20 wherein said treated solid oxide compound comprises alumina, 1 to 3 millimoles of nickel per gram of alumina, from 4 to 20% by weight chlorine based on the weight of said treated solid oxide compound before calcining, and is calcined for 3 to 20 hours at a temperature from 400 to 700° C.
22. A catalyst composition according to claim 14 wherein said treated solid oxide compound is calcined at a temperature in a range of about 300° C. to about 800° C. and a time in a range of about 1 hour to about 50 hours. 23. A catalyst composition according to claim 22 wherein said treated solid oxide compound is calcined at a temperature in a range of 400° C. to 700° C. and a time in a range of 3 hours to 20 hours. 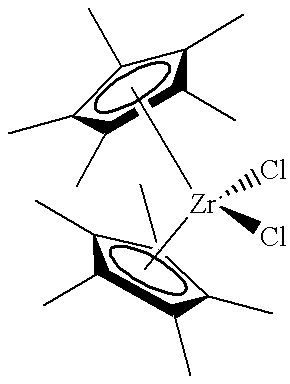 bis(cyclopentadienyl)hafnium dichloride, bis(cyclopentadienyl)zirconium dichloride, 1,2-ethanediylbis(η5-1-indenyl)di-n-butoxyhafnium, 1,2-ethanediylbis(η5-1-indenyl)dimethylzirconium, 3,3-pentanediylbis(η5-4,5,6,7-tetrahydro-1-indenyl)hafnium dichloride, methylphenylsilylbis(η5-4,5,6,7-tetrahydro-1-indenyl)zirconium dichloride, bis(n-butylcyclopentadienyl)di-t-butylamino hafnium, bis(n-butylcyclopentadienyl)zirconium dichloride; dimethylsilylbis(1-indenyl) zirconium dichloride, nonyl(phenyl)silylbis(1-indenyl)hafnium dichloride, dimethylsilylbis(η5-4,5,6,7-tetrahydro-1-indenyl)zirconium dichloride, dimethylsilylbis(2-methyl-1-indenyl)zirconium dichloride, 1,2-ethanediylbis(9-fluorenyl)zirconium dichloride, indenyl diethoxy titanium(IV) chloride, (isopropylamidodimethylsilyl)cyclopentadienyltitanium dichloride, bis(pentamethylcyclopentadienyl)zirconium dichloride, bis(indenyl)zirconium dichloride, methyloctylsilylbis (9-fluorenyl)zirconium dichloride, and bis-[1-(N,N-diisopropylamino)boratabenzene]hydridozirconium trifluoromethylsulfonate. 25. 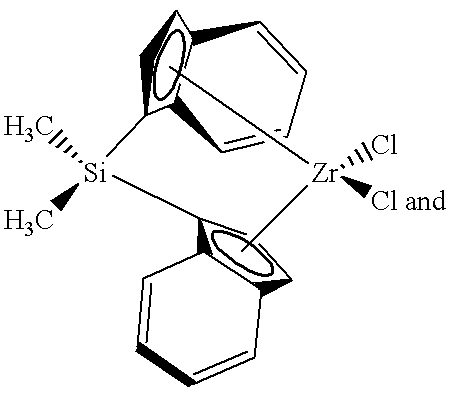 A catalyst composition according to claim 24 wherein said organometal compound is selected from the group consisting of bis(n-butylcyclopentadienyl)zirconium dichloride, bis(indenyl)zirconium dichloride, dimethylsilylbis(l-indenyl)zirconium dichloride, and methyloctylsilylbis(9-fluorenyl)zirconium dichloride. 26. A catalyst composition according to claim 14 wherein said halogen is present in an amount in a range of about 10 to about 100% by weight, where the weight percents are based on the weight of said treated solid oxide compound before calcining. 27. 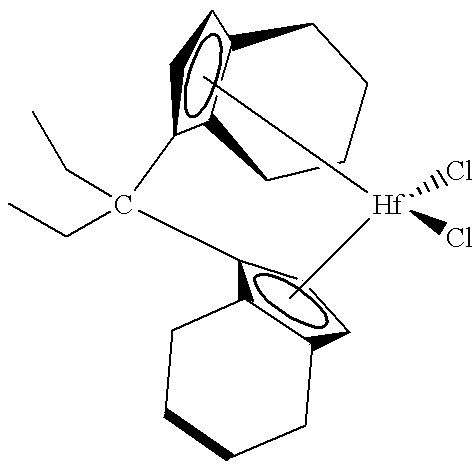 A catalyst composition according to claim 26 wherein said halogen is present in an amount in a range of 15% to 75% by weight, where the weight percents are based on the weight of said treated solid oxide compound before calcining. 28. A catalyst composition according to claim 14 wherein said nickel is present in an amount in a range of about 0.5 to about 5 millimoles per gram of nickel-containing solid oxide compound before calcining. 29. A catalyst composition according to claim 28 wherein nickel is present in an amount in a range of 1 to 3 millimoles per gram of nickel-containing solid oxide compound before calcining. 30. 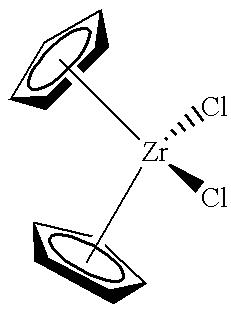 A catalyst composition produced by the process of claim 2. 31. 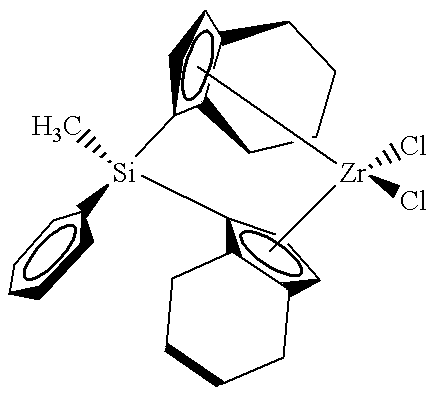 A catalyst composition produced by the process of claim 3. 32. A catalyst composition produced by the process of claim 9. U.S. patent application Ser. No. 09/080,619, McDaniel et al. 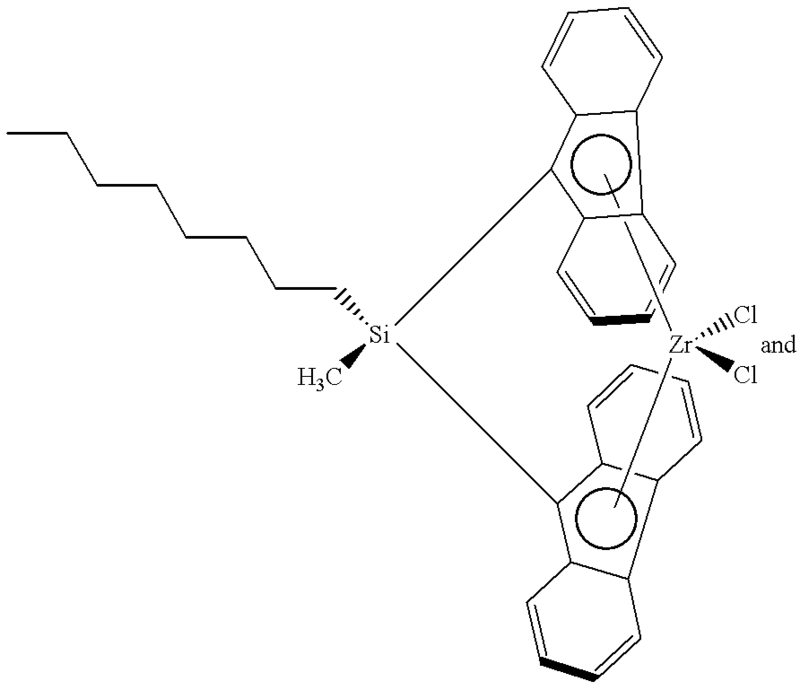 ES2356362T3 (en) 2011-04-07 Polymerization catalysts to produce polymers with low levels of long chain branching.